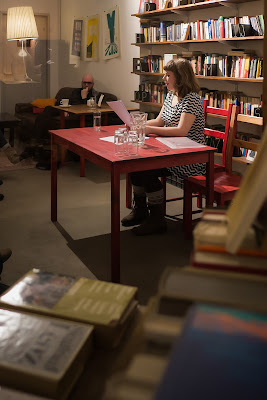 Last week, I did my first ever public reading of my creative written work, as part of Der Lesende Krake. 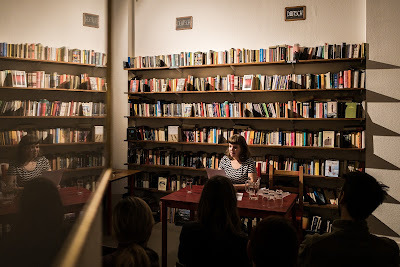 This is a monthly series featuring writers reading in German, English and French, taking place at the wonderful Raum B bookshop in Neukölln, which stocks mainly secondhand books in French (serves coffee and wine, too). 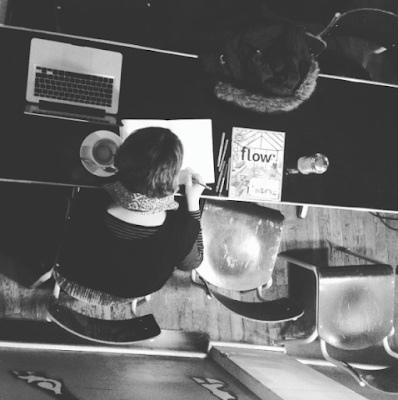 The piece I read was a short story I had written a couple of years prior; autobiographical in the sense that it was mixed together from a couple of different personal experiences, fictive in the sense I'd changed names and tweaked some details. To be honest, I don't think I would have gone for it if I weren't in the habit of sharing my work anyway, which I do monthly at my writing group. That's definitely a hurdle to overcome. It took about 15 minutes to read out (the story comes to 3,000 words or so, for reference). I kind of had a sore throat but only took one gulp of water - and felt so awkward I made a corny joke. Anyway, it was really cool. I'm looking forward to my next opportunity to do something like this! Click here to view more photos from the event, featuring the other great readers Robert Klages, Allison Krupp, Myriam Louviot, Anna Pawlicki and Maike Gaca!